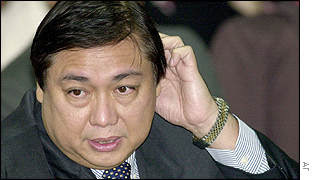 MANILA, Philippines – Jose Miguel "Mike" Arroyo confirmed through his lawyer on Wednesday that he met Jose "Joey" de Venecia III in a "purely chance encounter" at a golf clubhouse but denied ordering him to "back off" from the national broadband network (NBN) deal. Jesus Santos, lawyer and spokesperson of the President's husband, said Mr. Arroyo did meet De Venecia III in mid-March but his version of the story differed greatly from that of Speaker Jose de Venecia, Jr.'s son. A tangled web of lies you weave, First Gentleman. And I suppose there were waiters around who could corroborate your statement? Ang tagal nyo na nga pinag-isipan, ang tanga pa din ng sagot nyo?! Gee, Homer is that you?